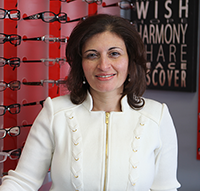 Dr. Amany Ramsis Wissa is a fully licenced Optometrist and had obtained legislation in Ontario through the College of Optometrists of Ontario early in 2010 directly after qualifying at the School Of Optometry, University of Waterloo. Dr. Wissa is also an active member of the Ontario Association of Optometrists (OAO) and (CAO). Her interest in Ocular Health and Medical conditions that affect the eye goes back to her Medical Background where she spent a whole year of internship training in different medical fields following her MBBCH accreditation in Medicine in 1991 (Ain Shams University, Cairo). Dr.Wissa had received accreditation with The International Council of Ophthalmology in 2001, followed by accreditation at The Royal College of Surgeons of Edinburgh in 2003 (FRCS Ed). Prior to this she had obtained a Master’s degree in 1995 for research and assessments in Retinopathy of Prematurity (Ain Shams University, Cairo. Dr. Wissa has now extended her services to the BramptonPeel region after serving as an associate in the Kitchener area and St Catherine’s Niagara region. She is now welcoming patients in her new office located at Main Street North (Highway 10) and Williams Parkway, in Brampton. We provide designer glasses, Lasik referrals, sports eye wear and the best in name brand sunglasses including Fendi and D&G. Patients with eye infections can now get prescriptions from optometrists instead of waiting to see their family Doctor.